by Strategic Entertainment Inc., Marketing Department - August 16, 2004. What do you think about our movies and music projects? 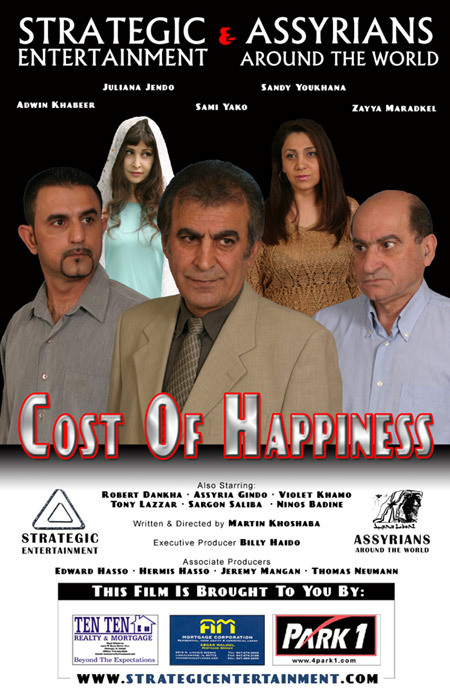 Assyrian Movie, “Cost of Happiness”( View trailer), Slated For Release In Late September! CHICAGO, IL. (SE) — Strategic Entertainment and Assyrians Around The World are proud to announce the release of their 2nd Assyrian movie. “Cost of Happiness” is a feature-length dramatic film about a young Assyrian man, David (Adwin Khabeer), who is struggling to find happiness in his life. After the loss of his mother (Juliana Jindo), at an early age, David grows up trying to achieve the "American Dream" of prosperity, happiness, and love. In spite of all of David’s personal dilemmas, he continues to be an active member of his youth organization. He adopts a new task for his youth group, her name is Ator (Assyria Jendo), a young girl that is stricken with cancer and needs help. David persuades the members to pool money for the ailing child. David's life reaches a turning point filled with critical decisions that involve alcoholism, deception, and his morality. This is when David must decide, what is the Cost of Happiness?